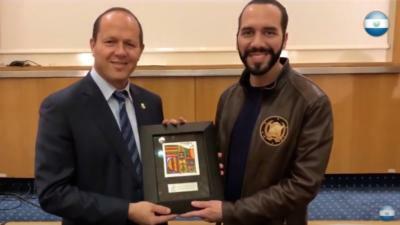 El Salvador’s news president-elect Nayib Bukele, then-mayor of the nation’s capital, San Salvador, right, meeting his counterpart, then-Jerusalem Mayor Nir Barkat, in February 2018. El Salvador’s new president is an Arab of “Palestinian” descent. He’s also a fan of the Jewish state. The small Central American nation is home to a community of 100 000 Palestinian migrants. While it is unclear how most of them view the Israel-Palestinian conflict, what we do know is that President-elect Nayib Bukele has no problem building relations with the Jewish state. While here, the then-mayor of El Salvador’s capital, San Salvador, met with his counterpart, then-Jerusalem Mayor Nir Barkat. He also laid a memorial wreath at Yad Vashem and prayed at the Western Wall. Arab media reported that Bukele faced harsh criticism from Palestinians in El Salvador over his “normalization” with Israel. It also seems that he was vilified, possibly by conservative Catholic elements, for visiting a mosque. In a Facebook post addressing what he called these “dirty” campaign tactics, Bukele insisted that he was simply not “religious,” and therefore had no problem visiting the Dome of the Rock, the Vatican and the Western Wall. However, while he has problems with organised religion, Bukele stressed that he does believe in Jesus and relies upon the Word of God to guide his life. “I respect all religions, and those who wish to believe in them, but I believe that the relationship with God is personal, I believe that no one is saved in groups, but that salvation is obtained individually,” wrote El Salvador’s new leader. I completely agree and applaud your position, Mr Bukele. salvation is absolutely a personal thing and wise men will always seek Jesus. Godly guidance allthrough your political career and tenure as president is paramount. We were all created by the Creator according to the scriptures, so loving everyone as a human being is the way out not hate. Now that we are in a civilized world, I see this as a very good idea to bring understanding between Israel and the Palestinians. Just like you have said, “whenever you are confused you ask Yahweh for wisdom He gave to Solomon,” if you stand with that decision I believe you will make the world to be a better place for everyone. I totally support your decision Bukele.